Entertaining Math Board Games To Play Over Vacation! Thanks to Pressman Toy and Goliath Games, my kiddos were given Board Games to get us ready for our next Family Game Night. Opinions expressed in the post are that of my own. 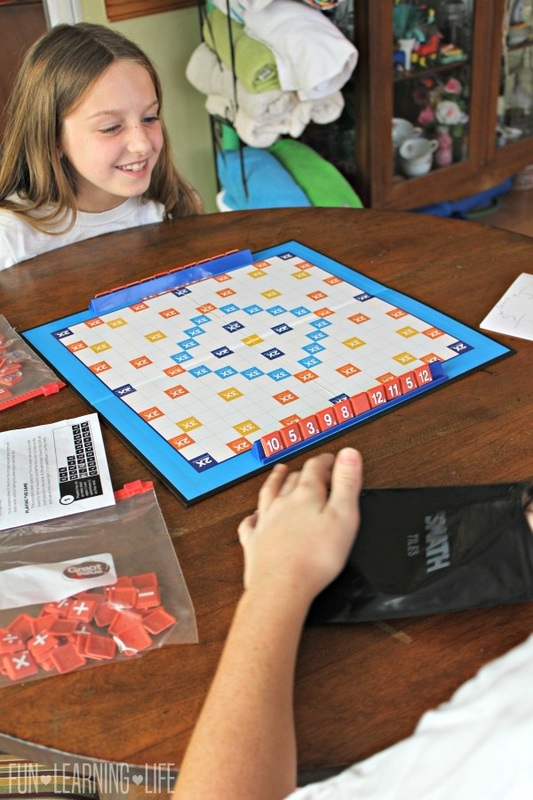 Are you looking for Math Board Games to keep your family entertained over vacation, or are you simply looking for a way to stimulate your kiddos brains while they are out of school? Now just to give a little back story, my oldest just came off of a season of soccer and had been limited on time. After dinner and homework during the week we really only had a window before bed for showers, and I really missed seeing them all play together. However, now that we are back to a regular schedule I was ready to have some down time and a few evenings at home together. 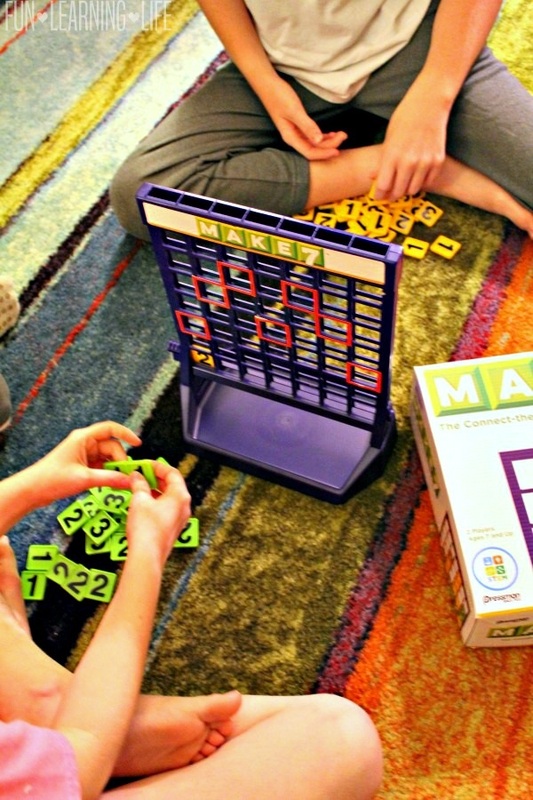 After my family’s recent game nights with Pressman Toy as well as Goliath Games, I am excited to share their experiences with these Math Board Games! For ages 7 and up, this “Connect-the-Numbers” for 2 players, is a game that consists of 1’s, 2’s, and 3’s. The object is to take these 3 numbers and MAKE7 (Add 7) up to the red outline squares. 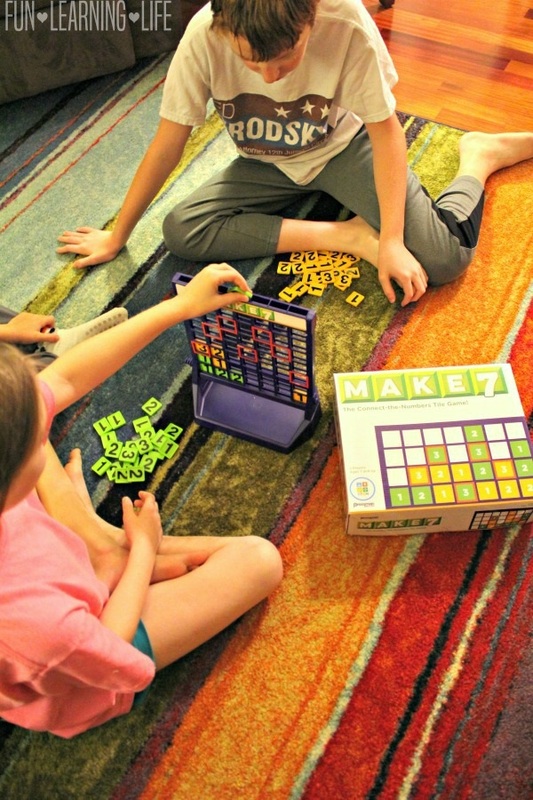 MAKE7 is a great way to learn addition and an awesome way to reinforce STEM skills through strategy, planning, as well as logic. Just so you know, adding together 7 isn’t as easy as you may think. At each turn, each player can block one another with their set of tiles. My 9 year old and 12 year old played and my youngest even got to put a few of the tiles in on his older brother’s behalf. This game teaches what patterns are and uses strategy in order to break a code. For ages 6 and up, this set includes a Mastermind Board, 72 Jungle Animals, 15 Small Red Creatures and 15 White Creatures for scoring. It is a 2 player board game with 3 levels, and the object is to set a pattern as the code maker while the code breaker tries to figure out what the combination is through a series of turns. 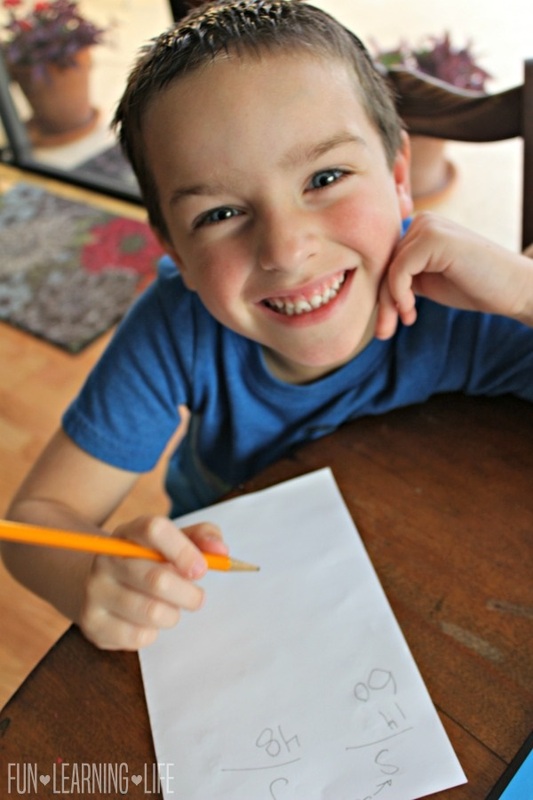 Mastermind for Kids can be adjusted based on the age of the players and can grow with your children. All 3 of my children were able to play this game on level 3. 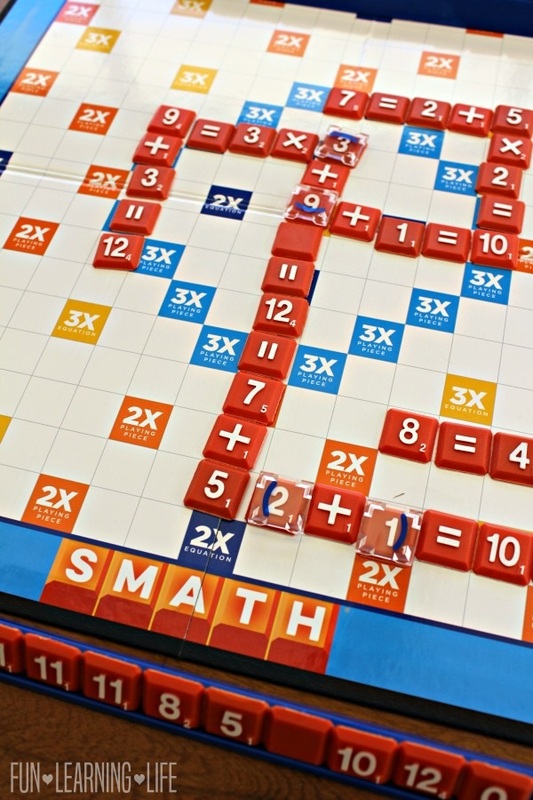 If you have a child that is just learning addition and subtraction, or heading into more complex problems with multiplication and division, SMATH is a board game that they both can play. My daughter is in 3rd grade and has just started learning multiplication, and her brother is in 6th grade and can do more complex problems. 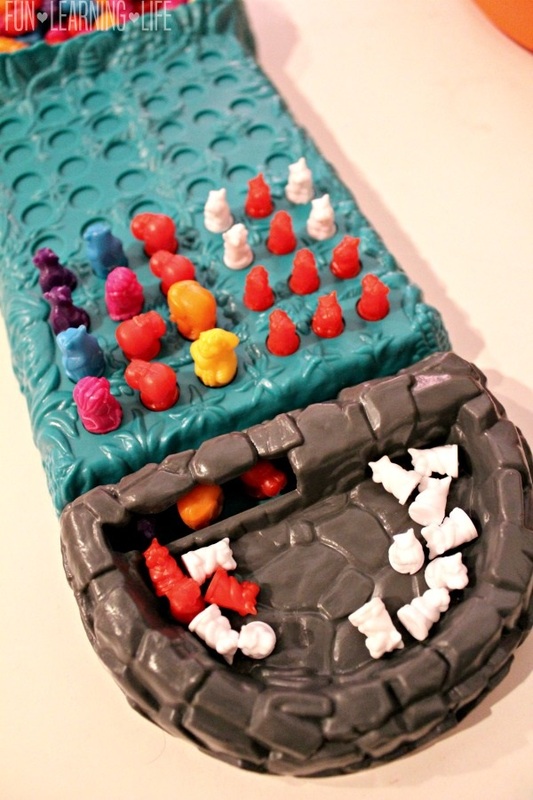 Just like MAKE7, this is entertaining way to reinforce STEM skills through the use of strategy, planning, and logic. This was a little advanced for my 5 year old, but he still had fun keeping score. As a parent, it was neat to see how far my kiddos have come in their education and my daughter can observe and learn from her older brother’s moves. We previously owned a Pop! the Pig for many years, but were missing a couple pieces. This was perfect timing to get a replacement from Goliath Games because this type of play still hasn’t gone out of style for my 2 younger kiddos. Pop! 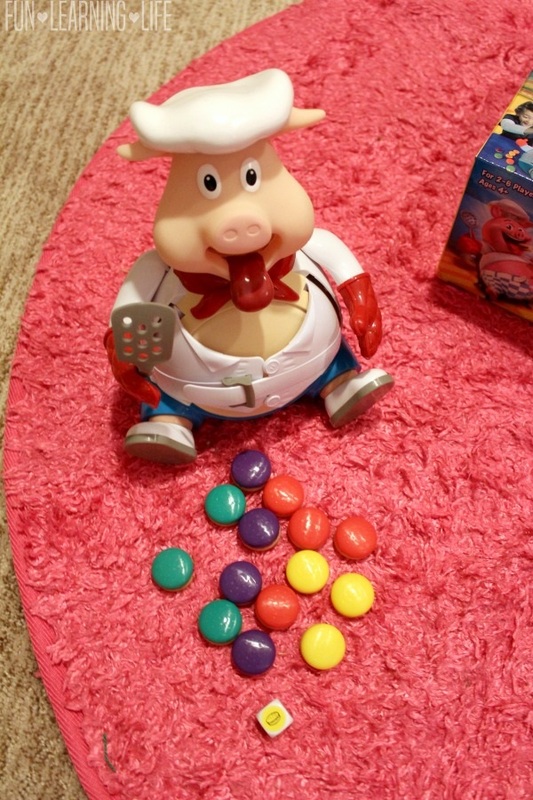 the Pig is great for teaching colors as well as counting to younger children, and it sure does keep my guys entertained. Plus the laughter of anticipation on whether or not his belly will pop, is hilarious to listen to. This was actually my family’s second experience with this game. We had played it almost 6 years ago when I was about 3 weeks away from giving birth to my youngest son. Needless to say, the rules of the game had escaped me and we had to do a little refresher. Out of all the games we tried, I would say this was the most challenging. Rummikub is for two to four players and ages 8 and up, the object is to create runs of the same number sequence and sets of the same number in different colors. Each turn is timed by a minute and this is a game that is constantly moving pieces around. Players can pull apart other runs and sets from previous turns and the winner is either the first person to empty their rack or the highest score after multiple rounds. Looking for another educational as well as entertaining board game? Although it is not Math related, be sure to also check out Wordsearch! for spelling fun! This needle in a haystack playing got my kiddos’ competitive sides going as well as reinforced their spelling skills. 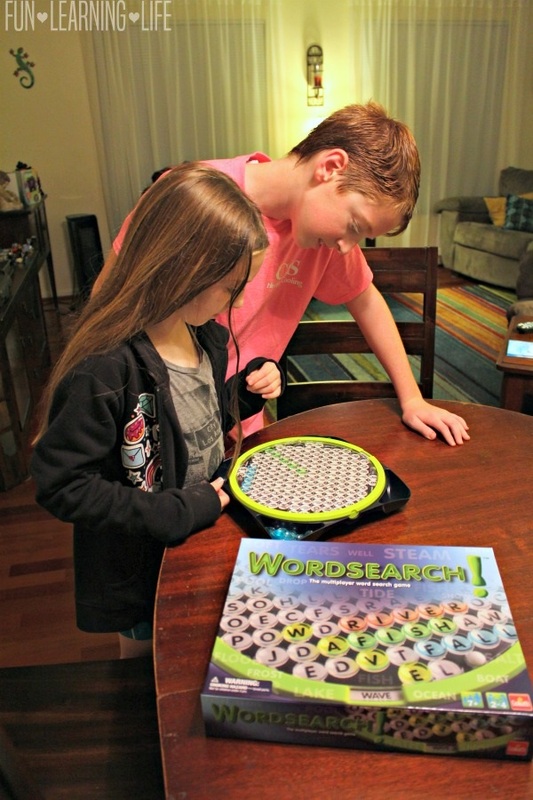 As they turned the wheel to the next game play, not only did they have to race to recognize the word quicker than the other player, but they had to remember to yell out the phrase “Wordsearch!”. To learn more about these board games as well as other products be sure to check out the brand websites at Pressman Toy and Goliath Games. Have you ever played any of these games before? If so, which is your favorite or do you have another Pressman Toy or Goliath Games favorite? I hope you find these Math Board Games To Play Over Vacation help keep your kiddos busy, and our experiences inspire a future family game night. 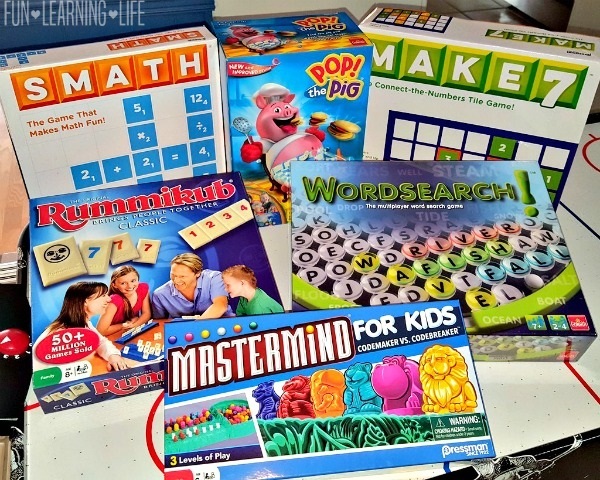 Thanks to Pressman Toy, I have been authorized to giveaway Rummikub and Mastermind for Kids, over a $42 value to One (1) Lucky Fun Learning Life Reader! * Participants must be 18 years or older to participate and live in the contiguous United States. Odds are based on the number of entries, and by participating, you agree to these terms and the laws set forth by your individual state. Entries will only be accepted through the Rafflecopter Form, and the website is not responsible for disruption of the page or service which could cause problems with entering. The winner will be contacted through email (make sure you check your spam or junk mail) with the Subject line “Winner of Rummikub and Mastermind for Kids!”. Shipping information, including email, phone, and address will be collected at that time. The winner has 48 hours to respond, after that an alternate will be chosen, and so on and so forth. This website does not sell personal information. The prize will be fulfilled by FLL. This website does not share information with 3rd parties unless specifically expressed in a specific promotion or giveaway. This giveaway is not associated, nor sponsored by Facebook. 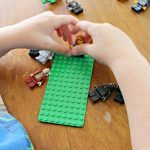 Minifigures Magnet Idea With LEGO® Brick Set GIVEAWAY from Growing Franchise! 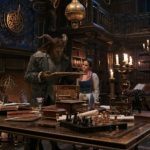 Disney Beauty and The Beast Partnering With DOGObooks For Summer Reading Prizes! 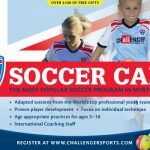 REGISTER for British Soccer Camps and GET A JERSEY, BALL, T SHIRT plus MORE! I have not played any of these but look forward to playing them all with the kids. Never played any, but they all look fun. 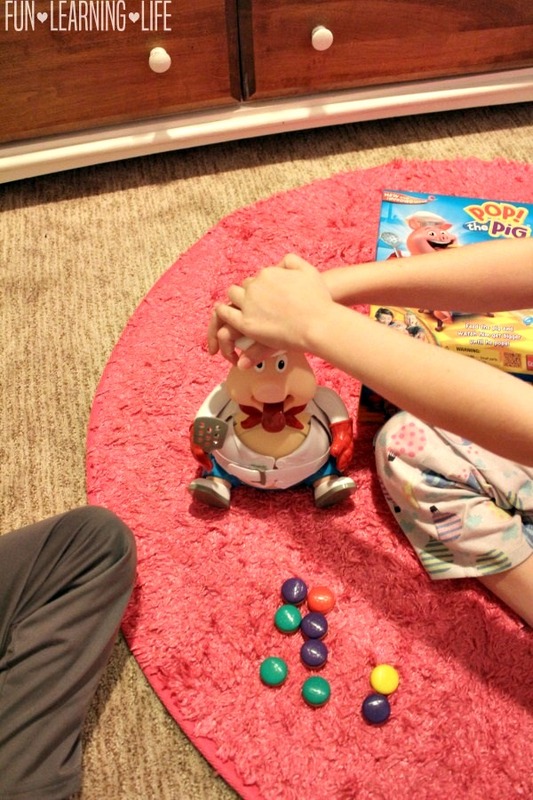 I have played Pop the pig with my granddaughter and she loves it. It is a cute and different game. I've never played either game but we love let's go fishing and pop the pig. I've never played the kids' version, but I remember playing Mastermind and really liking it. We've never played any of these before but they look super fun! I have played Rummikub before. It is a fun family game to play. 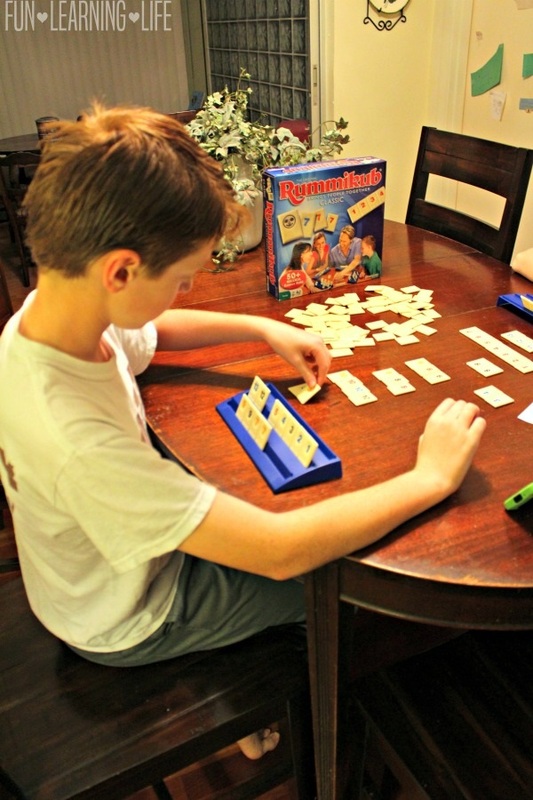 Rummikub is a long standing family favorite - but would love to try some of the other ones! I've never played any, but they all look fun. I have played Mastermind before but it was the adult version. Mastermind is one of my favorite games. I've never played either game. I remember playing mastermind with my brother when we were kids. I haven't played any of these games but I play games with my grandson all the time when he comes to visit. I have not played any of the games, my daughters would love this. I have not played these, but my youngest wants pop the pig. We have not played any of these. I'm interested in SMATH. I have not played any of these. They look like great fun; while being educational. If I win, I look forward to playing these with my grandkids. Thanks for the chance. 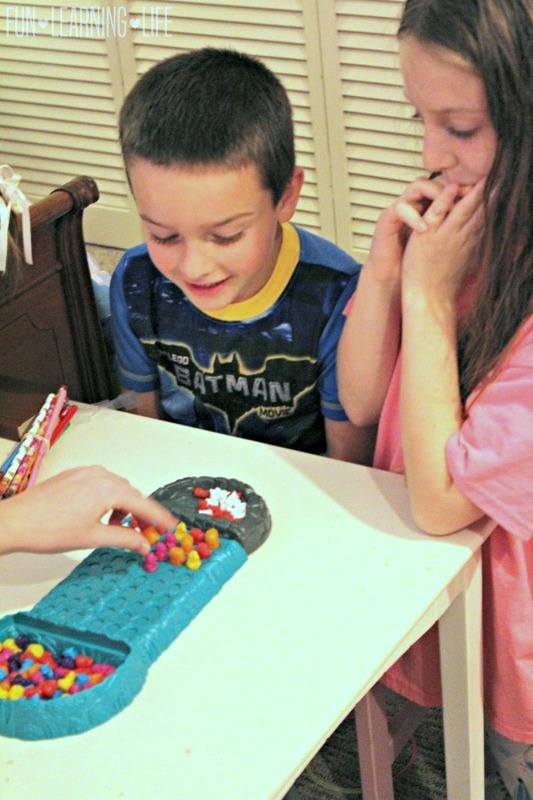 We frequently play Battleship and Mastermind with our kids/grandkids - depending upon the age, we adjust the rules so they have a chance to learn strategies at their pace. Always LOTS of fun and they remain interested. Haven't played any of them but boy would I love you introduce them to my children. My youngest autistic child needs the stimulation. Good job! We love to play Rummikub. My daughter is an adult now and we still play this game. So many memories and so much fun! Never played any of these but they look fun. I'm trying to introduce more board games into the family, I think it's a good way to connect with the kids. SMath looks amazing! We've played Rummikub - so fun! I haven’t played any of these games but my board game loving 7 year old would love to try some new games! I've played the original Mastermind a long time ago, but not the kids version. 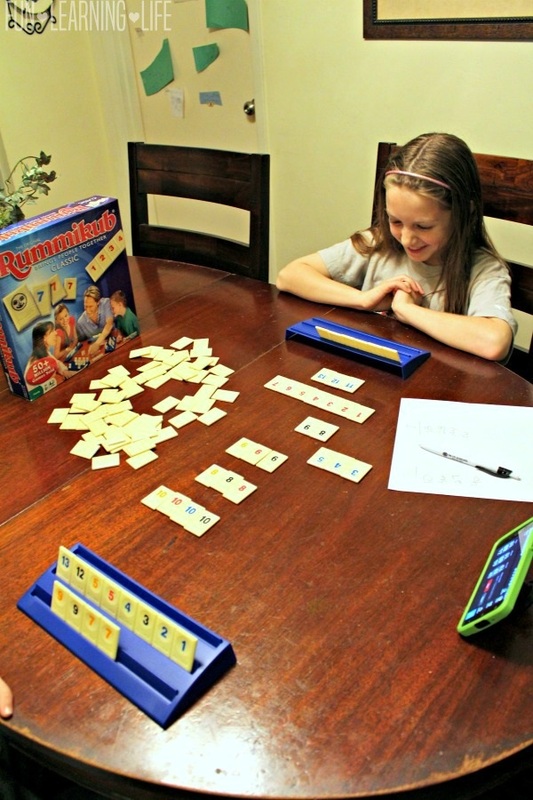 I have not played any of these games before, but Rummikub looks like a really fun one for my kids. We have never played these games before, but would love to! I haven't played any of these before. Would love to try with my kids! No I haven't played those games. I played the older version of Mastermind when I was a kid. I've never played these before. I did not play any of these games, but I would love to..funny names! No, never played any of them before. I have not played these games. I'd probably would like the Word Search the best and I love word games. I've never played these before! i have not played any of these games before but they look like a lot of fun. I have not played these games before. I have not played these games. If I win, I will most definitely play with my grandchildren! I HAVE NEVER PLAYED EITHER OF THESE GAMES...BUT I AM SURE I COULD LEARN WITH MY GRANDSONS. We've played Pop the Pig before and loved it! I have played Rummikiub before! I love playing Rummikub with my oldest kiddo! I've never played any of these games before, but my daughter, who is crazy about math would love them! We have played Pop the Pig and loved it. Lots of laughs!! I have not played these games before but my son is learning addition and subtraction and Smath would be perfect for him. I like the other games as well. Apart from developing skills, I see these games as a great way for family bonding and teaching kids work together with their friends and siblings. A good method to develop brain. Yes we ave played these games, we actually own Pop The Pig, it's a blast! We've played Mastermind and really enjoyed it! I've never played these games before and I'm not very familiar with the brand. I do, however, recognize Rummikub and Pop the Pig. Never played these before...looks like fun though. i think we need to have more games available for kids and families . Never played any, but they all look like something she would enjoy. I have never played any of these games before but they do sound challenging and fun to play. We love playing mastermind. The word search looks really fun! We play classic games once a month for game night. I've played both Rummikub and MasterMind. I learned to play Rummikub as a kid, and it's still one of my favorite games. Mastermind is such a fun game. I have never played these games before but they look like they would be so much fun for the family. We have played before. We played Mastermind. I love Rummikub and would love for my daughter to know this game! Such fun playing this. never played these game before. I've played Pop the Pig and Rummikub with my kids before. We love playing board games. I've never played any of them before but they all look really fun. I haven't exactly played these games; have played similar games though. These all look great for family friendly game nights! Excited!